Today we hear from one of our very own, Heather Webb, whose historical BECOMING JOSEPHINE just released this week to national acclaim from Kirkus Reviews as well as the New York Journal of Books. Becoming Josephine is based on the true story of Napoleon Bonaparte’s first wife, Josephine. Born Rose Tascher, she survived divorce, war, and prison before becoming Josephine. Tell us more about your historical heroine, Heather. Rose Tascher’s life before Napoleon was fascinating and rich, and it seemed a shame that such an intriguing woman should be defined only by her status as the wife of a ruler—particularly since I believe she made Napoleon’s success (if that’s what one should call it) possible in many ways. With his rageful tantrums and ego-driven agenda, I believe he would have crashed much sooner if Josephine had not smoothed things over with domestic ministers and foreign diplomats. Though whether or not that’s a good thing is questionable, I can say her choices were primarily made out of love for her family and the good of her people. The Empress truly wished her people well and gave generously throughout her life without expectation—even to her enemies. What’s not to love about a humble, yet beautiful woman who helped her fellow man? As for her faults, they endeared her to me all the more. After the years I’ve spent with her in my head, I feel as if she is a friend. Share with us a bit about your research process. I researched for about eight months before I wrote a single word, and then I continued to research in dribs and drabs throughout the entire writing process. I tried to take a comprehensive approach—biographies of important characters, histories of the Revolution as well as those of Martinique, Napoleon’s reprinted letters, and documentaries. I studied art and literature movements from this period, china patterns, fashion, weapons. I could go on. Researchitis is a disease we historical fiction writers suffer from. What in your opinion was Josephine’s biggest defect? What two words would you use to describe Josephine? Cunning: Josephine had many men. She was attractive, certainly, but not exactly a beautiful woman. But she knew how to work it! She was famous for her Creole accent and swaying hips, saying precisely the right thing at the right time. She seemed to know what made people tick and how to soothe their ill spirits or bolster their confidence. And it wasn’t just men who responded to her, women adored her as well. Brave: Josephine faced slave rebellion, the September massacres, losing several friends and a husband to the murderous tyrants of the Revolution. She was imprisoned and nearly died. She graced the halls of some of the most famous palaces in the world and was even compared to a queen—a very precarious title after such tremendous bloodshed and unrest. It’s one thing to “face” all of those horrors and pressures, it’s another to rise above the filth and hate and become a beloved icon. The woman was tremendous. If there was one thing of hers you could own, what would it be? Her Tarot deck, without a doubt. I have my own cards and a gorgeous hand-carved box that my husband made for them. What I would give to place hers inside it! 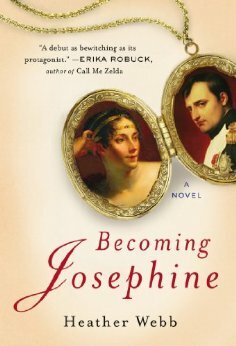 Leave a comment this week for a chance to win a copy of Becoming Josephine. The deadline to enter is Friday, January 10th. Becoming Josephine sounds captivating and very special. What a fascinating novel which interests me greatly. I enjoyed learning about Josephine and her life. thanks for this lovely giveaway. I love to read historical fiction but have never read anything on Josephine. This book sounds fascinating! Thanks for the giveaway!! Love historical fiction – especially this era. Nothing better than being swept away into a story from a different time. Thanks for the chance to read this! Cannot wait to read this book, it sounds fabulous; entertainment with education! Perfect! Eight months of research! It shows, Heather — it shows in that it doesn’t show, if that makes sense. That is, the details serve the story so well instead of the story serving the details. This looks awesome. Josephine is one of my favourite people in history. I am so excited to read it. Have been reading so much about this book sounds perfect for me. This looks like a great read — Josephine was such a fascinating woman. So interesting! I found myself thinking the same thing about Josephine’s defects, which I guess was really more me reacting to the time period and women’s options back then. It made me sad that this is how she had to survive. If her decisions to sleep with the men she did would’ve been based on her true desires, I’d have felt differently (and in the scenes where there clearly was that attraction, I loved reading about it!) But it was hard to realize that even a woman as brave and cunning as she had to resort to objectifying herself back then.